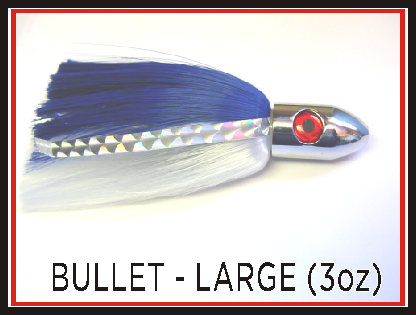 Draggin Eyes 2pc Chrome Bullet Large - 3oz head with Screw-in Hair Skirt - Comparable to the "islander/islander jr" but with the flexibility of interchangeable hair skirts. It's bead rigged on 6' of Ande Fluorocarbon, with Mustad SS 7/0 hook, and loop protector. 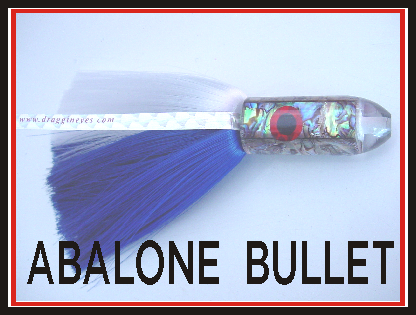 Great in front of Select/Large sized Ballyhoo or strip bait. Great on top or down deep. Put on your planer, downrigger or wire line rig. Uses our size LARGE replacement HAIR skirt and size Med/LG replacement VINYL skirts.